The engine is the first Claughton when new, 2222 Sir Gilbert Claughton. 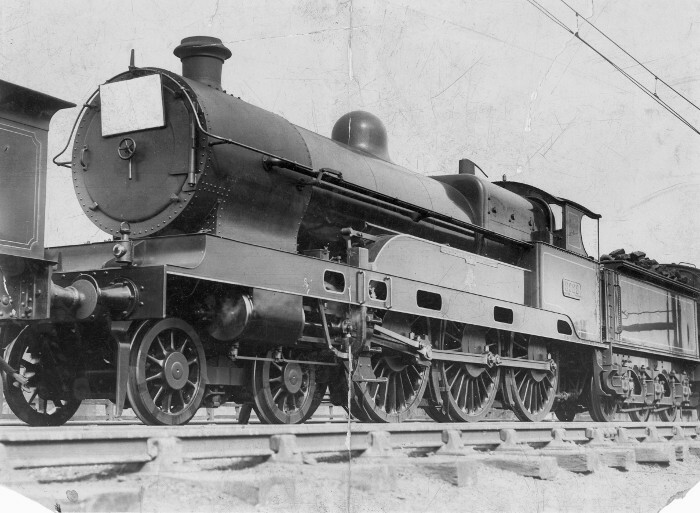 It is obviously new by its condition, and also because it has the front buffer-beam as original, before the lower corners were “clipped off” (after it, or another one of the first batch, hit the platform at Bletchley), and also has only a single pair of safety valves, whereas they all soon get a double pair in the usual style of casing but noticeably wider. 1. The Royal Train was pulled from Euston to Crewe by two George the Fifth class 4-4-0s 2665 George the Fifth and 5000 Coronation, and the Royal Party saw 2222 on exhibition when they toured the Works. So did 2222 haul the Royal Train back to Euston? 2. The engine on the left is not LNWR. So what is it? The lining looks LYR but most LYR express loco tenders had coal rails. FWIIW, the Claughton is coupled to a carriage. Would an LYR engine ever be found as a pilot to a Claughton? From the incurved corners of the lining, I think the tender on the left is from the Lancashire & Yorkshire Railway. There would be a red band outside the two white lines, but presumably this doesn't show clearly because of the pre-panchromatic photographic emulsion: the red lines on the Claughton are also almost invisible. As to which class of L&Y locomotive it might be, I can only guess - by the tapered buffer sockets and the absence of coal rails - that it wasn't a recently built engine such as an Atlantic or a 4-6-0, but something older. Maybe a 4-4-0? In July 1913 the Royal Train was running in the north-west for several days and when on the L&Y was hauled by one of two 4-6-0s of which 1514 had a tender not fitted with coal rails. The attached picture (below larger version) shows the train at the temporary Rainford Halt although the angle hides the tender buffers it could be a match. Tour details may be found in The Locomotive Magazine August 1914 pages 179-180. The two 4-6-0s may well have been together at some point even if not double heading. It looks as though the Claughton is attached to a carriage with a high roof profile, but the Royal Train brake vans were low (cove) roof profile with clerestories. And would the LYR locomotive have worked to Crewe? But perhaps the photo was taken somewhere other than Crewe. What are the overhead wires (catenary??). If the overhead wires are cantenary, could it be Liverpool Aintree Sorting Sidings, the only likely location I can think which might be so fitted. The headboard is identical to that on the engine in a photograph taken by F. E. Mackay on 4th April 1913 of 2222 passing Wembley in pouring rain with the 9am from Euston to Aintree. It was published in The Railway Magazine for May 1913. So it seems likely to have been the same occasion. There were departures of special trains from Euston to Aintree at 7.15, 7.35, 7.50, 8.05, 8.15 and 9am. The 9am was all First Class and the cost of a combined return rail and refreshment ticket was 64 shillings. The train ran to Wigan Junction and was scheduled to cover the 194 miles in 226 minutes. One of the other trains is believed to have been hauled by 2663 George the Fifth. It was photographed on Whitmore troughs. 2222 is also thought to have been photographed at Burscough Triangle, when it was coupled to a North Eastern Railway two-cylinder 4-6-0. The GCR two-cylinder 4-6-0 Sir Same Fay was also there. The only L&Y class that has a tender like that ahead of 2222 in the photo seems to be the 0-6-0s. Perhaps one had worked to Aintree with a train from somewhere not very far away such as from Manchester. Is the catenary on the early Liverpool-Southport electrification?